This app was born out of my frustration with Servant Salamander's half-assed file list utility that wouldn't traverse subdirectories. I needed a list of files from a directory with over 300 subdirectories, so I sure as hell wasn't going to do each directory individually. Like some applications I've done before, this one has been beefed up more than what I originally required of it and is thus the perfect addition to one's utility program toolbox. -removed %u, %v, %w, and %z. they are superseded by new inline arguments. -fixed %f (File Name), %g (Name Part Only), %h (Extension Part Only), %p (Path), and %e (Relative Path) when outputting directories. in general, directory matches are now treated like files. I made this simple app as a replacement to using the blank screensaver when I'm leaving the computer (usually for the night). Instead of the monitor(s) eventually going to standby after a certain idle time, they'll go immediately when you run this program. This saves power (since I know I won't be back for awhile) and keeps the backlight glow from disturbing my sleep. When I say "simple app", I mean really simple, like 1 line of code simple. It takes a single function call to perform, but yet Microsoft couldn't be bothered to include this anywhere in Windows' interface. It actually took me more time to make the icon than to do the code. Tip: If you put a shortcut to this program in your Start Menu somewhere, you can set the "Shortcut key" to whatever hotkey you want and use that to put the monitor(s) into standby. 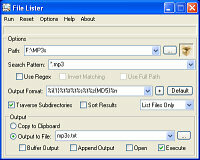 This program was the answer to all the problems my previous "found on the internet" alarm program had (see images). My alarm focuses on reliability, ease-of-use, and useful features so that the user is always alerted in the appropriate manner of their choosing and with minimal hassles. The features from the Documentation follow. Note: This function is provided only for compatibility with 16-bit applications written for Windows. Applications should store initialization information in the registry. This is a program that will take a Motherboard Monitor (definitely works for 5.3.3.0) High/Low log in CSV format, parse it, and output a properly formatted CSV file with only data in individual columns and each reading on a different row, suitable for import into a spreadsheet. This program was used to support a column I did on PC air cooling, found here. 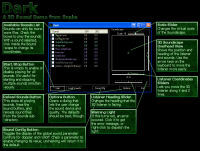 Source code is included so you can modify it to suit your needs if necessary. It was made using Windows XP and JDK 1.5. Dungeon Crawler II is the technical successor to Dave Marsh's "Diablo 83: Dungeon Crawl", being that it was built off of the same code and rules. However, it is to be a complete overhaul of the game that will add even more RPG elements to a mere TI calculator game. This program is useful for fixing out-of-sync audio in video files. 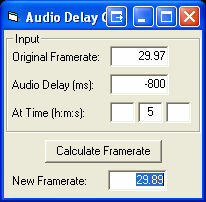 It does the math to find out what framerate will bring the audio back into sync. You will still need a program like VirtualDub to fix the video file. The Readme includes a complete tutorial on how to fix audio sync issues with Media Player Classic, VirtualDubMod, and this program. This is a quick program I made to remove log entries from this site's AXS logs, but it should also work with most other log formats. It's meant to remove a line from a text file if it matches the regular expression provided. You give it an input file and output file, and it'll complete the search and copy in a relatively short time (50mb in ~5 secs). It also can just check to see if there are any matches without the copying. I used .NET because it has good built-in regex support and file IO performance.